I am taking some advice from an avid reader who wants to know how I got into the cabinet business. So here is the long version, just kidding. Firstly it was a job to help out while I was finishing college. I started in June of 2001 and I was just processing orders and working part time while going to school. By December 2002 I finished my bachelors in Liberal Studies and was enrolled in the credential program to be a teacher. Well first off my mom had kept hinting around for about 6 months prior that she was going to quit doing the books. My dad kept hinting that he would pay me what a teacher makes if I would stay and take over her spot after I graduated. So I was offered a job as the CFO of the company. Well with no experience and taking math called; "how to teach elementary school students Math 1A and 1B, I was LOST. I felt overwhelmed and my accountant helped me through all of it, teaching me from the beginning. If it wasn't for her I wouldn't have made it. Anyway, I was still going to school at night to become a teacher and the task was daunting to say the least. I started to get disenchanted with the idea of being a teacher and I really started to learn all I could about the cabinet business. 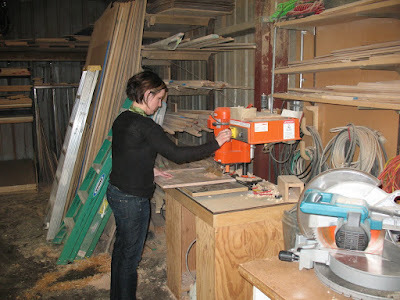 I found cabinets very interesting to say the least, and there was and is so much to learn! I am learning a trait about myself that I love a challenge, and this is definately a challenge for me. I want to stress this point though, that I invested in Weber's Cabinets because of one person, and that is my dad. I believe in him, and he is very talented at cabinetmaking. I can't say how many times I hear, "beautiful work your dad has done", and "it's wonderful custom work." Even when we are going through such hardship with construction being slowed to an almost complete stop, I got the advice of "you are very brave for investing in this business." I don't consider myself brave just knowledgeable. I know what my dad can do with cabinets and what he has done, and it is none other than the best. Congratulations to Lori Haas! You are the winner of a very lovely wine bottle chopping block and a fabulous set of knives! Thank you to all of you who participated and I am looking forward to having more of these types of contests. Please tell me Lori what you think of the knives and your chopping block! I will be excited to hear from you. Again congratulations! 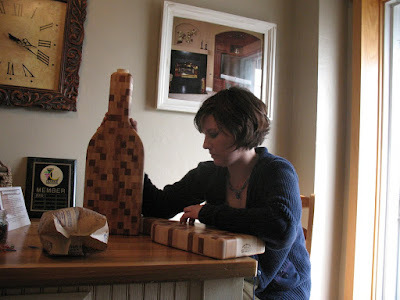 Because I am such a wonderful person, I am giving away one of our beautiful chopping blocks shaped like a wine bottle. Along with a set of three cutting knives from CSN STORES/Paula Deen Knife Set. I will be taking all of your comments from this post which will automatically enter you for a chance to win these gifts, for FREE! Be honest, it will not hurt your chances to win. Tell me what you think of my posts, what I can do better, or if you just want to tell me I am perfect in every way. I won't discriminate, just comment and let me know your feelings. (Although if you are my husband and you are reading this right now, your opinion doesn't count, and you cannot win)! Just kidding (but not about the winning part), thank goodness he loves me anyway. Anyone that posts a comment for this post will be entered in at www.random.org by me and I will pick a winner at random! It is that simple. Make sure you leave me your email address so that if you do win, I can contact you for the best address to ship the products. This post will be valid from today till March 12, 2010 at midnight where the comments will not be counted thereafter. Leave me more than one comment, you will get more than one chance to win! I look forward to hearing from you, and I look forward to congratulating the winner! P.S. So for your information, look at the link to see the exact knives that you will be winning and look at the pictures to the left to see the chopping block you will be winning also. If you also want to check out the beautiful products from www.csnstores.com and look up their new store at Home Bars, you will be pleasantly surprised. Oh well, I know why he did that, because it was a lot faster if he finished and did the rest of the doors. I know how that feels because I get really impatient myself when I have to let Jakob or Nathan help with something and it takes them forever because they are only 6 and 3 years old. And I might add that my dad might be afraid that I will get better at it than he is!